Born in Halifax, Nova Scotia Canada. 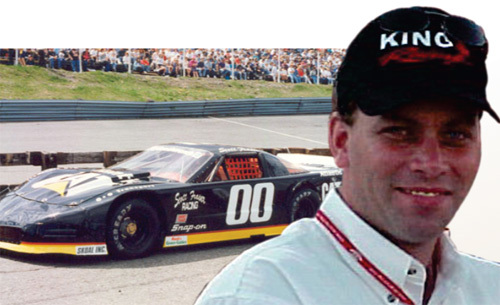 Scott was an accomplished Stock car driver and car builder from Shubenacadie, NS. He is the son of Maritime racing legend Frank Fraser. His brother Frankie is also an accomplished stock car racer. Scott began racing at age 16 in the Street Stock division. He moved up to Open-Wheel Modified and the MASCAR Circuit. He went on to the Pro-Stock and ASA Circuit. Scott's racing record of 16 years speaks volumes of his talent. Scott was a great ambassador for Canada and Maritime Motorsports. Scott Fraser was just 16 when he drove his first race, competing in the Street Stock division at a local track, Onslow Speedway (Truro, Nova Scotia - closed 1990). From there he moved to an Open-Wheel Modified division where he won the championship at another local track, Scotia Speedworld (Halifax, Nova Scotia). That same year he was also runner-up for Rookie of the Year on the MASCAR circuit, a Maritimes-based late model touring series. At the age of 21, he competed in his first international field when the American Canadian Tour (ACT) visited Nova Scotia for a double-header weekend. He entered both races and scored a third and a fourth place finish among short track standouts Junior Hanley, Kevin Lepage, Brad Leighton and Robbie Crouch. His road course racing - and late model racing - debut came at the 1992 edition of the Moosehead Grand Prix (Halifax, Nova Scotia). He had the third fastest car in the MASCAR division but was forced to the garage area when the transmission broke. The 1993 edition of the same race saw Scott start his second road course race - and finish second. In 1994, at 23, Scott Fraser won an ACT race at Scotia Speedworld after rebounding from a blown engine in practice for the event and subsequently using a borrowed engine to run the race. Between 1993 and 1998 he won six consecutive Riverside 250 races, the longest and most prestigious annual stock car race on the MASCAR circuit. In 1996, Scott experienced perhaps the most successful season ever for any driver in the history of Maritime motorsports. While competing on the MASCAR circuit he scored an impressive 12 of 15 feature wins en route to his first touring series championship. Nine of those wins were consecutive. 1997 saw Scott run a limited MASCAR schedule, winning four of the six races he entered. He also chalked up win number 13 of the 18 pro stock races ever run at New Brunswick International Speedway (NBIS - Geary, New Brunswick). Two NEPSA races at Sanair, Quebec, finishing third in the first race and setting fast time for the second race. In 1998 Scott Fraser was crowned MASCAR champion for the second time in three seasons. Among more than 40 competitors he captured six of 13 checkered flags and clinched the title. At the end of '98 season he made the decision to partner with Rollie MacDonald, a veteran Nova Scotia racer, who admired Scott's racing talent and had the personal desire to see Scott fulfill his dream. The King Racing team was formed with Scott as the driver and Rollie as the owner and car chief. The team was a combination of Scott's former team and Rollie's former team. In February of 1999, the two hopefuls and their crew made the long trek to The World Series of Asphalt Stock Car Racing at New Smyrna Speedway in Florida. Fraser's performance "vaulted him into the national limelight" said Late Model Digest. In 10 consecutive nightly races he competed against 69 of North America's best short track stock car racers, setting fast time five of the 10 nights, winning two feature races, with four top fives and six top 10s. The Fraser/MacDonald combination finished third overall in the final point standings in their maiden adventure. Fraser and MacDonald returned home to Nova Scotia to formulate a plan for the future, clinching the International Pro Stock Challenge (IPSC) championship featuring competition among the best teams from New England and Eastern Canada. They also ran a limited MASCAR schedule. In all, Fraser ran 12 races that year, finishing the season with a championship, four wins, nine top fives and 10 top 10s. In July 2000, the King Freight Lines sponsored No. 00 Chevrolet arrived in Chicago for their ASA debut. They stunned onlookers by qualifying second and finishing eighth. In total, Scott competed in six ASA races that summer, recording four top-10s and qualifying on the front row twice. Encouraged by their rookie season in ASA, Fraser and MacDonald decided to go full-time in 2001. While still searching for a sponsorship, they competed in 11 events before wrecking their only racecar at the very same track they had made their spectacular debut just one year prior, Chicago Motor Speedway. Discouraged, they headed home to Nova Scotia to regroup. Just four weeks later over $39,000 had been raised through the Fans Of Fraser campaign and Scott Fraser began building a new ASA racecar. The funds were raised by selling lap sponsorships at $100 each. Every fan got their name on the new blue Fans of Fraser racecar that debuted at Memphis (Tennessee) in September 2001. The Fans of Fraser car raced a second time at Indianapolis Raceway Park (Indiana) later that month. In 13 2001 ASA starts, Fraser scored four top 10 finishes. Four late model (pro stock) starts saw two top 10 finishes. 2002 was a rebuilding year for Scott's Atlantic CAT pro stock team and a late start but in just eight pro stock races he won six of the biggest shows on the Northeastern seaboard, including Oktoberfest at Thompson, Ct. In 2003, Scott Fraser drove the Rollie MacDonald owned entry on the Maritime Canadian based Maritime Pro Stock Tour. They won two of 11 events and finished third overall in final point standings. Other than those wins, Fraser visited Victory Lane on three other occasions in 2003. He finished first in a Pro All Stars Series event and a 250-lap open event at New Brunswick International Speedway (Geary, NB). The NBIS 250 win was Scott Fraser's biggest payday, winning a whopping $24,500. His last win came September 27 in a 150-lap open event at his home track Scotia Speedworld, in a race some described as his exhibition of pure racing talent. In October, in what would be his last stock car race, he wrecked his racecar during a fiery crash at Concord Motor Speedway in North Carolina. Besides his great driving talent, Scott built top-quality race cars at the Scott Fraser Racing Shop schooled initially by Canadian racing legend and fellow Nova Scotian Junior Hanley, and by his father Frank, himself a successful racer. In 1999 he was named Nova Scotia Male Athlete of the Year. He was inducted to the Maritime Motorsport Hall of Fame in 2006, the Canadian Motorsport Hall of Fame in 2007, the Colchester Sport Heritage Hall of Fame in 2010 and the Nova Scotia Sports Hall of Fame in 2014. Scott is still so missed everywhere in the racing world here on the east coast. I grew up with Scott and what an amazing man and human being. It is so sad knowing hewas taken way to soon but honured to have known him the way we all did in Shubenacadie. NS. RIP Scott. Miss your smile. Xox. Yes I got to meet him on a couple of occasions at Scotia Speed World. Heck of a driver and nice guy.